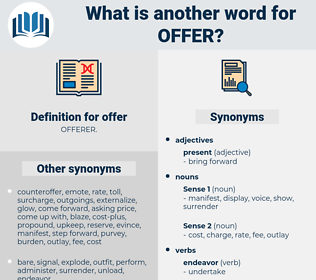 What is another word for offer? supports, features, Resources, champions, rebates, rolls, Advertisements, postings, victims, launches, provides, Delivering, supplies, quotes, bid, bids. data, invitation, Delivering, recommendation, Recommendations, render, bid. Progressed, moved, Introduced, constituted, required, elaborated, transmitted, Approached, outlined, extended, Filed, saw, initiated, Discussed, raised, Ran, intended, aired, planned, Bought, Gave, made, Brought, bid. Conferring, Volunteering, Pledging, featuring, Affording, Generating, Arising, Dispensing, Extending, maximizing, Throwing, assuring, Handing, Carrying, equipping, Sustaining, picking, putting, getting. afford, represent, confer, lend, constitute, allow, congratulate, serve, produce, perform, open, address, render, bid. furnishes, progresses, represents, recommends, Lends, opens, affords, describes, creates, exposes, harbours, portrays, Grants, extends, sponsors, files, boasts, yields, allows, donates, leads, insures, earns, raises, Lodged, seeks, Faces, bites, aims, hands, holds, trains, adds, buys, puts, features, launches, provides, supplies, bids. lay, Gave, expressed, Brought, afford, represent, confer, lend, constitute, allow, serve, produce, convey, perform, open, provides, address, render, bid. idleness, denial, withdrawal, refusal, taking. fight, withhold, take, discourage, keep, dissuade, hide, withdraw, hold, withstand, veto, conceal, resist, refuse, take back, deny, stop. She must offer me to be set down at home. As a friend he had been true to her ever since, but that offer could never be repeated. put up, accost, solicit, hook. bring out, produce, bring on. give, provide, render, supply, pay, furnish, market.